← A Hopeful Idea: The End of Checked Exceptions? Why can Scrum deliver surprising results already in the first month of adoption? Because it helps the team focus on what’s really important. We had Jeff Sutherland visit Oslo XP meetup a few weeks back. Jeff is co-creator of the Scrum method (with Ken Schwaber) and CTO of PatientKeeper, a US health information company. His presentation focused on the effects of Scrum on distributed teams, and on the effects of adopting Scrum in projects. Specifically, he was talking about the adoption of Scrum in the CMM level 5 company Systematic. 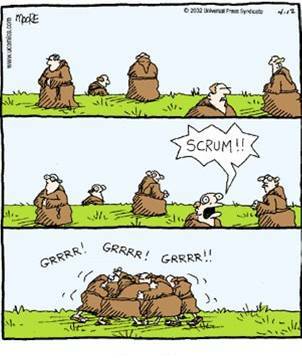 The claim from his studies is that Scrum can deliver a substantial (100% ?) speed up in both mature (as defined by CMM) and novice organizations in the first month. I asked Jeff the question: So what changes in the organization when you see this speed up? How does it feel different? The answer is “focus”. People get a sense of what is important and why. This means less wasted time wondering what to do next, and better priorities. It sounds simple, but it is not. It’s hard work. See pictures from the meetup here, download Jeff’s slides here.